computer | I'm not stalking you. My asbestos friend invited my son and I along for a girl’s night out to Monster Jam at the Huntington Center in Toledo, Ohio. My son was a little scared at first. 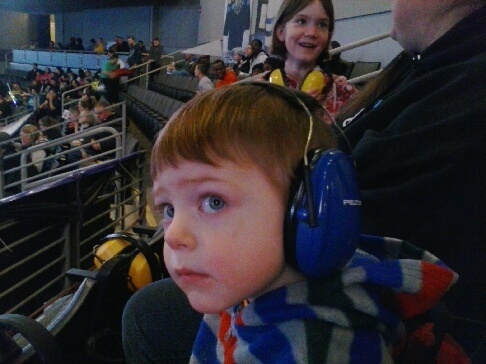 But I had him equipped with proper hearing protection and he really got into it when the trucks did their freestyle at the end of the night. 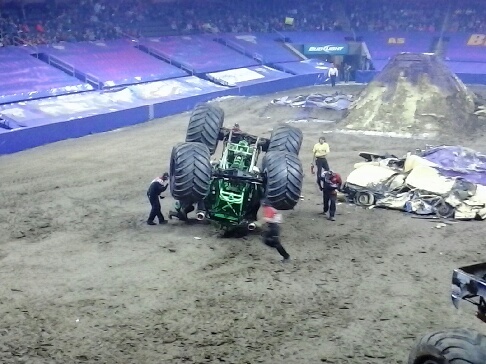 Grave Digger (the only truck that was there that I had heard of) flipped over–twice! That was awesome! We got all the drivers’ autographs afterward. Grave Digger! He was even on fire (a little)! I was sad that the Monster Mutt and the Scooby-Doo trucks were not there. But I would definitely go again sometime. Kids, when you get a new computer ALWAYS make recovery disks right away, and store in a safe, logical location. Posted in A day in the life, What I Learned This Week and tagged computer, failing, girls night out, Grave Digger, hard drive, hearing protection, Huntington Center, laptop, Monster Jam, monster truck, Ohio, replace, Toledo. Bookmark the permalink.